I enjoyed the profile of psychology professor Herbert Terrace [Winter 2012–13]. I enrolled in his introductory psychology class in the early 1970s and found myself intrigued by the subject matter. I distinctly remember the sleepless “all-nighter” cramming for the final exam. Afterward, I changed majors from pre-architecture to psychology. Professors such as Terrace and Eugene Galanter, a noted psychophysicist, exemplify the scientific side of psychology rather than the pop-psychology that permeates our culture. Professor Norma V.S. Graham taught my first statistics class, and I studied graduate-level statistics at Michigan with Professor David H. Krantz, who’s now at Columbia. Since those college days, I’ve made a pretty good career teaching psychology at a South Texas community college. I am grateful to the world-class university that opened its doors to a confused 18-year-old from the borderlands, and to all the great professors who serve as role models of academic excellence. It’s been 44 years since the night of “the bust” in 1968, but I’ll never forget Professor [Ronald] Breslow’s actions that long night. As one of the walking wounded, having been whacked in the head by a Tactical Patrol Force billy club while simply observing the commotion (and following orders to disperse), I was wandering around outside the locked campus when he magically appeared, extremely disturbed by what had just happened to our sacrosanct temple of learning. It was 4 a.m. and nobody could get back into their dorms. Professor Breslow gathered as many students as he could fit in his car and drove us over the GW Bridge to his home. I remember watching the sun rise as we headed for safety. He fed us and allowed us to sleep a bit before returning us to campus. I was able to wash my bloody hair. Professor Breslow’s freshman chemistry class stands out in my memory. He made chemistry magical! Now rewired from a 35-year career as an emergency physician, I have pivoted into fighting climate change. Whenever discussing ocean acidification — the process of adding club soda to the seas — I think of him. That means that Ron Breslow resides in my heart and soul. Thank you, Columbia, for Professor Breslow. He is a great teacher and humanitarian. I read with great pleasure “Pride of the Lions” [Winter 2012–13]. 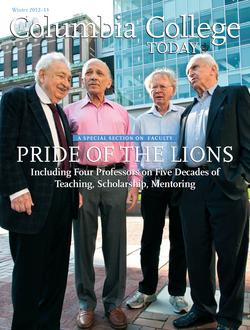 Of the four featured professors, my contact was in the mid-’60s with Professor David Sidorsky. As an undergraduate I took a series of inspiring courses with him. It was he who awakened me from my “dogmatic slumbers” (to borrow the words of Kant). I will remember Professor Sidorsky’s lucid and penetrating lectures as well as his quickness of mind and amazing serenity during class discussions. His intelligence, wit and unfailing kindness to his students impressed me deeply; now, many years later, I think of him with great respect and admiration. It is wonderful to know that he is still going strong. Professor Breslow took a course with a terrifying reputation and made it a wonderful, exciting year of detective work and problem solving. His inspirational teaching turned my academic career around, enabling me to become a physician educator. I was happy to see that many subsequent generations of Columbia students have benefited from Professor Breslow’s superb teaching style. I will forever be grateful to him. 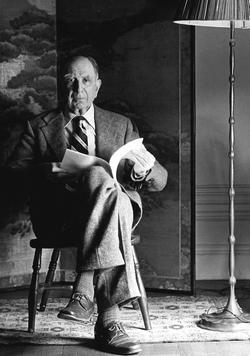 Professor James Gutmann (Class of 1918, '36 GSAS) at his apartment in 1979. Photo: Nick Romanenko '82I am reading the fabulous Winter 2012–13 issue that arrived a day or so ago, and am brought to a halt halfway down page 19, in the piece about Professor [David] Sidorsky (whom of course I never encountered as a student though he sounds quite interesting). You name a James Goodman as one of his early teachers, but I think Sidorsky must have meant philosophy professor James Gutmann (Class of 1918, ’36 GSAS), who together with professor Robert Carey ’29 GSAS led a fascinating advanced CC course that I attended in the 1948–49 academic year, a course that kept us all on our toes thinking hard about where the world we were then living in was going as well as how it had gotten to where it then stood. Both Gutmann and Carey were fabulous teachers, and I believe Gutmann should be remembered by his correct name; he never changed it, and was a good man indeed. Unfortunately, the article on Professor Carl Hart [Winter 2012–13] doesn’t say what scientific procedure he used to get his findings on drug use. The North Star of scientific method is double blind experimentation but this isn’t usually used with humans when it involves a substance suspected of being harmful. The tobacco industry rightly says that high statistical correlation between smoking and lung cancer doesn’t prove that the former causes the latter. (For instance, a chromosome that has a gene for a tendency to smoke can also have a gene for a tendency for lung cancer.) Nevertheless, the statistics and experiments with rats make us wary of smoking. But Professor Hart belittles the usefulness of experiments with rats. I see nothing unethical about not experimenting on people. The opposite can be unethical, as when blacks were purposely given syphilis without their knowledge. That may be scientific, but not ethical. I assume Professor Hart did nothing like that, but just what did he do? I’d like to know the details of experiments rather than know how his personal history gives him insights. Eric Foner ’63, ’69 GSAS states [Winter 2012–13] that the talk show of Rush Limbaugh shows “overt racism.” This is an example of Foner’s McCarthyite smear tactics, whereby he smears a radio show without disclosing any facts to substantiate his statement. Furthermore, he states we should admire the American radicals, as these are the “people who are trying to make this a better society.” Really? What about all the Democrats and Republicans who have made this a better society — or does he think there are none? In addition, I personally witnessed the thugs in the Students for a Democratic Society who used force to prevent my friend from participating in naval ROTC exercises on the campus. Other members of this organization burned our campus. I do not feel that the violence and totalitarianism of the American radicals in the past few decades made the United States a better society. I do agree that radicals in the 19th century were different. I made a pilgrimage to the gravesite of my hero John Brown in Elba (Lake Placid), N.Y. I do not feel that the violent tactics of the radical left will make this a better society. That is why my parents escaped from the horrors of the Nazis and the Communists. I was pleased to see the report of Scott Smith ’86’s promotion to brigadier general in the U.S. Air Force reported in the Alumni in the News section of the Winter 2012–13 issue. His dedicated service to our country and his record of leadership and achievement in our armed forces clearly deserve this recognition. As a guest at the ceremonies, I also was impressed by the number of Scott’s family, friends and colleagues who gathered for this milestone in his career. Columbia graduates who participated in the three-day celebration in Coral Gables, Fla., included John Murphy ’86, Pat McGarrigle ’86, Jack Merrick ’86, Matt Barr ’87, Arthur “Bunyan” Ajzenman ’83, Dr. Michael Goldfischer ’86 and Dominic DeCicco ’84E. I am happy to report that neither the appearances nor the strongly held opinions of any of these Columbians seem to have changed since the mid-1980s.